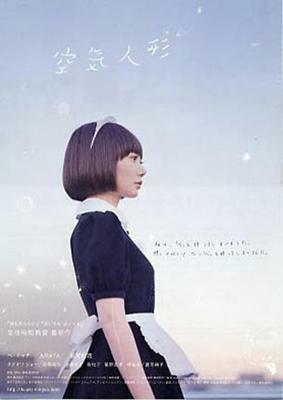 April 8—7:30pm UCLA Graduate Student Association and the ASUCLA Student Interaction Fund will host a free movie screening night for a Japanese movie, “Air Doll” (Directed by Hirokazu Kore-eda, 125 min, in Japanese with English subtitles) on Thursday, April 8th at 7:30pm at James Bridges Theater (Melnitz 1409) at UCLA. It is part of the Melnitz Movies and it is FREE to the UCLA community, including students, staff, faculty, and guests, and particularly on this day, for Japanese American community. Air Doll tells the story of a life size air doll that develops a soul. On exploring the world around her she soon falls in love with Junichi, a video store clerk. Just when everything seems perfect an unexpected turn of events throws her fragile existence into turmoil. At the core the film is a love story which explores the profound questions of human existence, Where do we find meaning in our own lives? What ultimately makes us human? The movie received Official Selection, 2009 Cannes Film Festival and Official Selection, 2010 Rotterdam International Film Festival. Maggie Lee, HOLLYWOOD REPORTER wrote, “An achingly beautiful meditation on loneliness and longing in the city.” J. Hoberman, VILLAGE VOICE notes, “At once sentimental and perverse, Air Doll is a highly resonant offering from the land of Bunraku puppets and pink movies, Mariko Mori and Hello Kitty.” “Nozomi’s journey of discovery, whether she’s being submissive to her “owner” or learning what it means to love, is especially piercing because it can’t possibly end happily. A deceptively airy film, Air Doll makes us reflect on our sexual assumptions and the depths of loneliness often endured by the inhabitants of large cities.” -Laura Kern, FILM COMMENT. Tickets are available at the Melnitz box office the day of the screening one hour before show time and are given out on a first come, first serve basis–one ticket per person! All screenings and appearances are subject to change on short notice so please check back here on the day of the show! Information can be found at UCLA Graduate Student Association.